The 30 Day Vegan Challenge is a great introduction to Veganism. Author, Colleen Patrick-Goudreau is challenging everyone to follow a vegan diet for thirty days to see the difference that eating a plant-based diet can make to your life. Colleen Patrick-Goudreau is a public speaker on the vegan lifestyle, and is also the author of The Joy of Vegan Baking and Color Me Vegan. 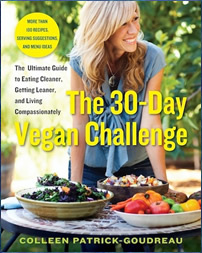 In her latest book, The 30-Day Vegan Challenge, she offers advice on the practical aspects of following a vegan lifestyle, providing you with tools to help you make the transition to this way of eating. This book is designed to address every question you may have about eating a vegan diet and to help you tackle the challenges that can arise when starting to follow a vegan lifestyle. Patrick-Goudreau explains the benefits of a vegan diet – such as a higher intake of fiber and antioxidants – and outlines the health advantages of this way of eating. She says that when you eat a vegan diet you will also be significantly decreasing your intake of saturated fats, trans fats, and heavy metals as well as reducing your risk of exposure to food-borne illnesses. She highlights the research regarding the use of vegan diets for the prevention, treatment, and reversal of cardiovascular disease. By the end of thirty days she claims that you will actually start to see positive changes in the biochemical markers of cardiovascular disease. The information in this 30 Day Vegan Challenge is also aimed at debunking common nutrition myths by providing readers with knowledge regarding the best sources of protein, calcium, iron, and omega-3 fats in a vegan diet. Also included are tips and advice about eating out, traveling, holiday meals, social events, packing lunches for school and work, baking without eggs, and achieving weight loss on a vegan diet. Vegetables, fruit, bread, oatmeal, pasta, rice, chickpeas, tofu, tempeh, mushrooms, soy yogurt, soy milk, flaxseeds, peanut butter, tahini, eggless mayonnaise, balsamic vinegar, soy sauce, salsa, dark chocolate. Exercise is recommended for weight loss, to improve cardiovascular health and for the prevention of osteoporosis. Readers are advised to choose an activity that appeals to them such as dancing, tennis, rollerblading, aerobics or going to the gym. The 30-Day Vegan Challenge: The Ultimate Guide to Eating Cleaner, Getting Leaner, and Living Compassionately retails at $22. Encourages the consumption of fruit, vegetables, nuts and legumes. Provides detailed information about following a vegan lifestyle. Educates readers on the best vegan sources of nutrients such as calcium and protein. Offers information about the use of nutritional supplements. Includes tips on replacements for non-vegan ingredients in recipes. Contains thirty days of menu ideas and vegan recipes. Will not appeal to dieters who don’t wish to eat a vegan diet. The diet is very high in starches including bread, cereals, pasta and other grain-based foods, which may cause problems for those who are sensitive to carbohydrates. Encourages the consumption of processed soy foods. Some of the recipes contain unhealthy ingredients such as white flour, white rice, sugar and nondairy butter. Does not include specific exercise guidelines. The 30-Day Vegan Challenge is a practical guide to help you get started with a vegan lifestyle. It provides tips and advice on subjects including meeting your nutritional requirements and dealing with the social challenges associated with following a vegan diet.